Aromatherapy mist infused with 3 essential oils; PEPPERMINT, SANDALWOOD & CEDARWOOD to sharpen Perception. 🌿You are The Observer -play your roles with enhanced perception. 🌿Sandalwood & Cedarwood establish a solid base. 🌿Peppermint awakens crystal clear perception and insightful observations. Only Therapeutic Grade Essential oils are used. Superior aromatherapy. NO Alcohol, NO animal testing, NO toxic chemicals. To be who you truly are you have to come out of what you are not. You are not these thoughts churning through your mind; you are not these roles you play. You are simply “I Am” -the observer - who you are without attachment. And in the play we call life, the “I AM” Aromatherapy Series helps us play our various roles gracefully and successfully. Every bottle is mixed by hand with positive energy after meditation (no mass machine production). Therapeutic Grade Essential oils are selected for this aromatherapy spray to create an exceptionally powerful mental, emotional and physical effect.. Considered to be sacred oil, sandalwood has been used during praying rituals and meditation sessions for more than 4.000 years. Woody and earthy, sandalwood is best known for its calming and relaxing effects. The oil extract from sandalwood has been shown to efficiently sedate inflammation, anxiety, fear, stress and restlessness. An excellent sedative, sandalwood essential oil calms the mind, allowing you to enter a peaceful state of mind, relieving anxiety, stress or negative thoughts. It can be used to induce relaxation and to promote concentration and positive thoughts. 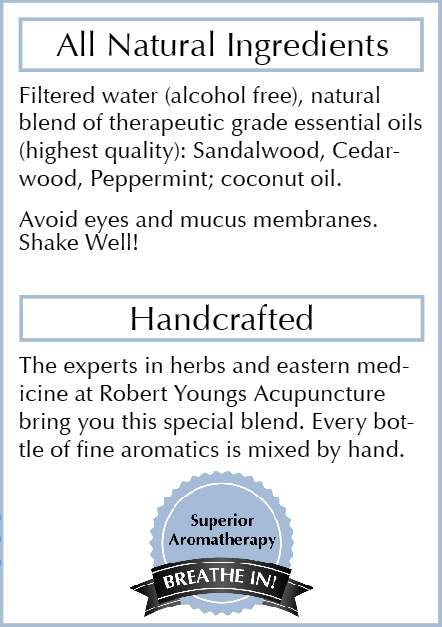 Spray essential oils onto palms or rub on chest, throat or/and feet. Try on your bed sheets, pillow, comforter at night or diffuse in room. Spray on paper tissue or on back of your palm and sniff. Try spraying on your chest, throat, back and feet. Steam inhalation - Add 4-5 sprays to a bowl of hot water (not boiling), cover your head with a towel, close your eyes and take in several deep breaths.